A MeshWORK can be described as a structured approach to addressing all needs in all appropriate ways at all levels for the overall good. While many models can illustrate fragments of a situation in greater depth and many different applications, techniques, therapies and other interventions will be pertinent in varying contexts, the core of a MeshWORK needs to be built on the Gravesian approach or a similar model (such as, perhaps, Jane Loevinger’s (1976)) for mapping the ever-emerging diversity of thinking in human nature. 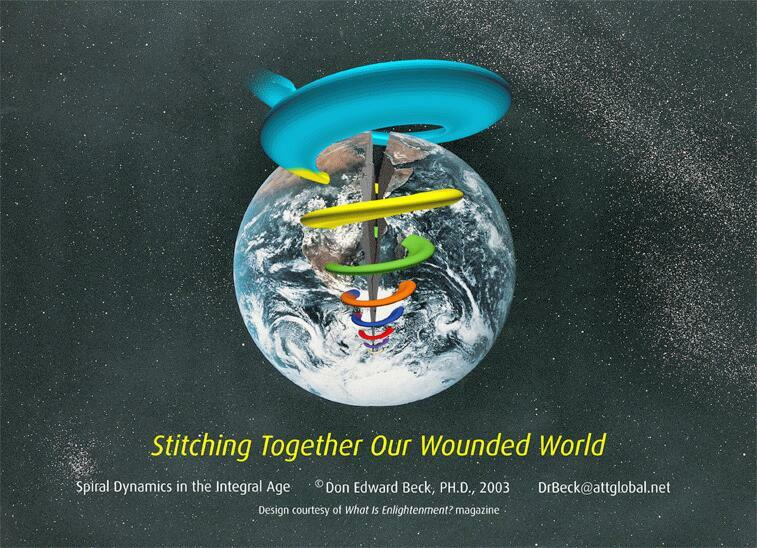 The MeshWORK concept originated from Spiral Dynamics co-developer Don Beck’s work in South Africa, helping design the early-mid-1990s South African transition from Apartheid to multi-cultural democracy. For approximately 17 years off-and-on (1981-98) Beck – in consultation with Clare W Graves until his death in 1986 – worked behind the scenes in South Africa. He used Graves’ model to facilitate the leaders of the main factions in moving beyond race and politics, to map out what Nelson Mandela later called ‘the Rainbow Nation’. By getting the leaders of the retrospective parties to think about people in terms of their thinking, rather than the colour of their skin, Beck enabled them to move on from the unhealthy and divisive memes of the past. Retrospectively Beck (1998) described his work in South Africa as “building a MeshWORK”. The term ‘meshwork’ is hijacked from the work of Manuel DeLanda (1995) and it could be argued that Beck isn’t using it in quite the way DeLanda intended. However, DeLanda’s theme of natural self-organisation of diverse components without them having to be homogenised is a perfect fit for what Beck postulates. What makes Beck’s concept quite unique is that it is not only broad – ie: including all parties – but it is deep – going right down into the motivational factors which drive individuals, groups and even nations. The approach recognises that the Value Systems (or vMEMES) which drive some will be very different to those which drive others. Of course, like many great thinkers, Beck has tended to review and evaluate his work over the years and sought to incorporate new ideas where beneficial. A step change of sorts was the 4Q/8L (2000b; 2002b) framework he developed from his alliance with Ken Wilber, arguably America’s greatest contemporary philosopher. This runs the vMEMES through 3 of Wilber’s (1995) 4 Quadrants and thus enables a much more more structured approach to MeshWORKing. More recently Beck’s thoughts have turned back to his days studying under the great social psychologist Muzafer Sherif. From Social Judgement Theory (Muzafer Sherif & Carl Hovland, 1961; Muzafer Sherif & Carolyn Wood Sherif, 1968), Beck has considered how vMEMES tend to assimilate or contrast others’ views with their own. From this he has developed the Assimilation-Contrast Effect – a vital tool for anticipating and managing conflict during the course of a MeshWORK. Why is it that so many change initiatives – in business, education and community regeneration – don’t work? Or, at best, they usually only partly achieve their goals? Way back in 1967 a meta-analysis by Larry E Greiner identified an average change failure rate of 73% amongst businesses. In 2000 Nitin Nohria & Michael Beer found a similar level (70%) of change failure. In their recent literature review, Carlos Cândido & Sérgio Santos (2015) found change implementation rates ranged from 28% to a jaw-dropping 93%! The galling thing is that such initiatives are designed usually by highly-intelligent people with the best intentions and are often supported by large financial investments. So why do they fail to accomplish their objectives so often? The Neurological Levels model of Robert Dilts (1990) demonstrates clearly that, unless an initiative impacts at least at the level of Values & Beliefs, it will not bring about real change. Yet so many change initiatives reflect – and may even seek to impose – the values of the intervention designers. If the values of those who are the targets of an initiative don’t match the values of the designers…. This is why Beck famously said: “If it looks good to you, don’t do it” – because what looks good to your values won’t necessarily be attractive to another’s values. There are no real value judgements in a MeshWORK beyond what is healthy for the whole Spiral. The ideal is to meet the real needs of all the interested parties – in a way that is at least not unacceptable to all. However, as TURQUOISE is said to recognise, there may be times when the needs of some have to be sacrificed for the ‘greater good’. And, since everything is subject to change, there is no final answer, no perfect equilibrium to balance the many demands – some of which will conflict. Even when a MeshWORK is functioning fairly well, there needs to be constant scanning for change and proactive adjustments to meet new needs as they arise.